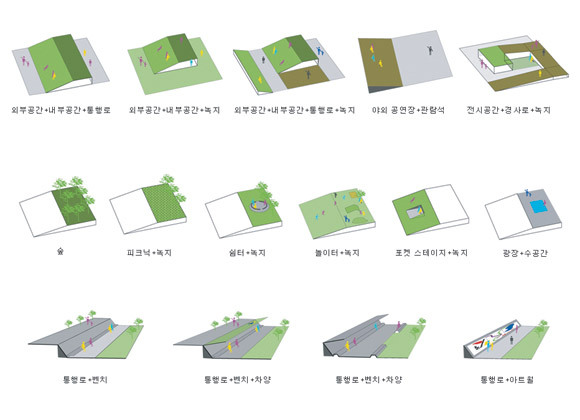 Located in the north-eastern part of Seoul, the brief asked for an existing park to be transformed and extended to accommodate the surrounding community’s vibrant cultural life. Binding the park into the city context and linking it to the library and proposed new museum, the circulation resembles a double helix which structures the landscape into spaces of varying scale and intimacy. A proposed new gallery on the edge of the park will offer cultural programmes and facilities. Outdoor exhibition spaces, performance places and sheltered areas to meet with friends alternate to encourage its appropriation for the everyday activities of the local community.